On my recent appearance on the fabulous Litopia After Dark, I was asked if there were any points of comparison between the pig in my pages and those in Parliament at the moment. I quipped that Toby would take offense at such a comparison, adding that, among their other good qualities, pigs care nothing for austerity. Which is all true enough, but in point of fact, the comparison has been made on numerous occasions, many of them implying either that the Government were pigs, or that their intelligence was no greater than that of a "Learned" one. 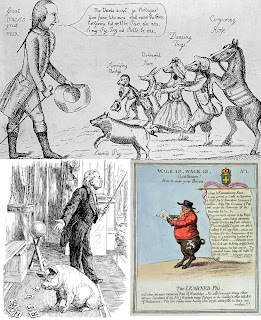 In first of the cartoons shown here, we see John Rolle, an MP who had been among the reliably faithful supporters of Pitt the Younger; a man of great size and "few words," he was described by Nathaniel Wraxall as a man whom "nature had denied all pretension to grace or elegance; neither was his understanding apparently more cultivated than his manners were refined." 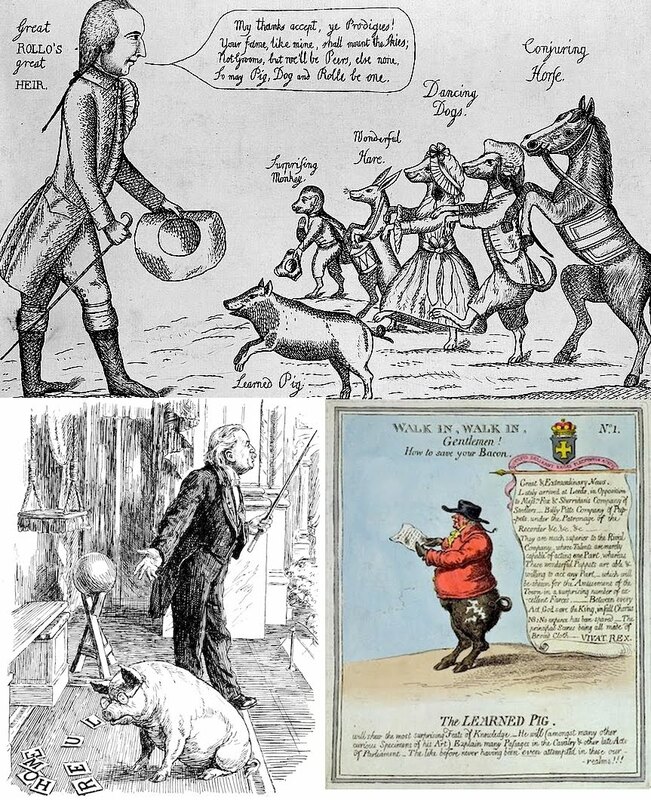 These qualities, apparently are what earned him a cartoon comparison to a pack of trained animals, among them the "Surprising Monkey," the "Wonderful Hare," and the "Learned Pig." And yet his more loquacious political enemy, Charles James Fox, suffered an even worse comparison when he was lampooned as being the "Learned Pig" himself, who will "show the most surprising feats of Knowledge," among them "explaining many Passages in late Acts of Parliament ... the like never before having been even attempted in these our Realms!!!" The third of our political cartoons depicts David Lloyd George, here not as a Pig but as the Pig's Proprietor. His recalcitrant subject is the Irish leader Eamon De Valera, who despite what the cartoon suggests is the prime minister's persistent prodding , seems unable to spell "Home Rule" for Ireland, a reference to the debates over the Government of Ireland Act of 1920, otherwise known as the Fourth Home Rule Bill. Other historical events, as it was to turn out, rendered that bill moot, but it's interesting as evidence that the "Learned Pig" act was still familiar to readers of Punch in the 1920's. Of course these images far from exhaust the subject of pigs and politics, not to mention related expressions such as "pork barrel politics" -- so I'm sure I'll return with more in the near future. But for now, at least, let it be said still that, when compared to most politicians, pigs come out by far the cleaner.